Although we were still days away from New Zealand, the weather took a turn for the worse. At these times having a balcony is neither here nor there. For me it was no great drama because I was still recovering from too much sun on Moorea. Surprisingly, though I used to be a sun worshipper, I don’t need to be out there all the time any more, partly because I have other things to do, and partly because I don’t want really leathery skin when I grow up; I mean, get older. One time we were at the Windjammer café and I noticed the Captain at the soft serve ice-cream stand, and I proceeded to talk to him and tell him what a good job everyone was doing, pitching in and serving. As part of the plan for defeating the Norovirus, it was all hands on deck, as mentioned in the “Nasty Norovirus” segment. I told him he looked too young to be a Captain, and when he mentioned something else I suddenly realised he wasn’t actually the captain. Later I saw a photo of him, entitled the Chief Engineer. Very similar in looks, Captain Claus from Norway was a lot taller, and I managed to have a photo taken with him eventually. The above title is not a misspelling for “Buffet” but a play on words. Our table was situated near the back corner of the dining room, next to another rather noisy table, which was at the very back. Sometimes the table on our other side had guests sitting at it, but as the cruise wore on, less of them appeared at the table, to the point that we renamed it “The Buffer Table” because it gave others a respite from us. It was a competition between the corner table and ours as to which was the noisiest! 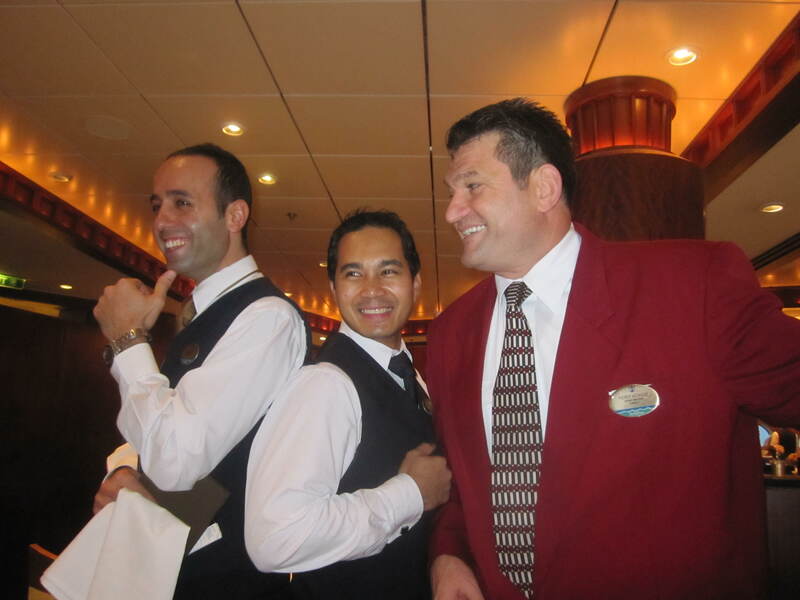 Our drinks waiter Ariston, from the Philippines was lovely, but we nicknamed our food waiter Ozgur, or Ozzie, from Turkey, our Turkish Delight. Ozzie reminded us of a taller version of our French friend Hanis, with that naughty little boy twinkle in his eye and a great sense of humour. Then every night the head waiter Ferit, also from Turkey, came to our table to tell us a joke, but sometimes he cheated and read them from his phone or itouch. Originally on the itinerary we were going to visit the Bay of Islands, but this was cancelled due to the earthquake in Christchurch. There would not have been sufficient fuel to manage to do this, with some guests being really annoyed but by and large people are fairly accepting of this sort of situation. It’s the fun you make yourself that truly counts. 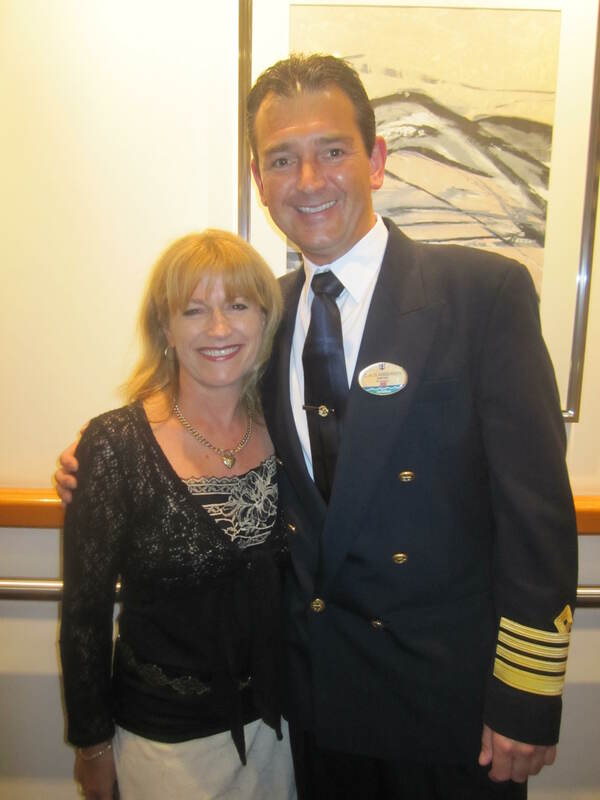 Everyone’s experience is different, whether you are on a cruise together or in a family. We all look at things from different viewpoints and that’s what makes the world go round. Wouldn’t it be boring if everyone thought exactly the same? Simpler maybe, but it helps make life more interesting with varied personalities. This entry was posted in Royal Caribbean International Cruise, Travel, travelswithprincessandquiquinou and tagged Bay of Islands, Captain Klaus, International Date Line, weather. Bookmark the permalink.